Malaga, on the Mediterranean Sea, is a deeply traditional Andalusian city. Yet with the Town Hall’s recent renovation program, Malaga’s image has really lifted in the last few years. Beautiful pedestrianised shopping streets peppered with trendy tapas bars and ice cream parlours, high tech interactive museums, and expertly renovated sites like the Gibralfaro castle and the recently discovered Roman ruins in the city – plus the added allure of constant sunshine and miles of city beaches – all help make Malaga a top Spanish cultural destination. Additionally, Malaga also remains one of Europe’s cheapest places to visit, especially for language students. Here is a top pick of the Malaga’s best Spanish language schools, with short and long-term courses available at surprisingly cheap prices. Malaga Plus is part of the international Idiomas Plus language school organisation and its chain of schools has been running since the 1980’s. The Malaga-based branch takes great pride in selecting its teachers based on university qualifications and experience, as well as their enthusiasm for teaching Spanish as a foreign language to immersion students. The school’s location and premises are also unique, with the classrooms based in a typical Andalusian building with a sunny roof terrace and gardens, only a short walk from the beach in Malaga’s charming old fishing district, Pedrogalejo. This school’s prices are extremely reasonable for the quality of tuition and facilities on offer, with 2-week intensive courses including 20 Spanish lessons per week starting at 274€. The school also currently offers a discount for “mini groups” of 3 students or more booking together, for all courses in 2014. Malaca Instituto offers an impressive amount of experience, having been founded in 1971. This school is efficiently managed and possesses both national and international accreditations, and also has a specially appointed department, which develops all the teaching materials used in the school. Located a short bus ride from Malaga’s historic centre, the school is set on a rising hill with views of the Mediterranean. Amongst other facilities, the premises boast a multimedia learning-centre with internet access and a mini cinema, a restaurant and bar, sun terraces, optional onsite accommodation and a swimming pool. Thanks to the onsite residence, Malaca Instituto enjoys a great campus atmosphere and the school puts a lot of effort into organising excursions, paella feasts and other exciting social activities. The school’s prices start at 20 Spanish lessons per week for 377€ ($315 or £523), and accommodation in the onsite “Club Hispánico” student residence goes for 480€ (£402 or $667) for a single room without half board, for the duration of two weeks. There are many other course lengths, types and accommodation options available. Malaga University is a public university, and their courses are extremely popular with foreign students because of the prestige attached to university language course certificates. At Malaga University, you’ll also have the possibility of gaining transferable credits for your studies back home on some of the courses, and on many of the courses you’ll have the possibility to sit a final examination and get an official certificate confirming your Spanish skill level. The teachers all have a degree in Spanish Philology. The University’s Intensive courses have six proficiency levels from beginner to advanced in groups of 8-14 students; this is a fairly contained classroom student number for public university language courses, further adding to the quality of the lessons. Because there are Intensive Courses starting each month throughout the year, you can pick a programme time to suit your own schedule. The university’s three-month Semester Courses are also very popular, offering a highly structured Spanish language course, plus for the more advanced students, additional culture lectures are available to complement the programme. The University’s student campus is in El Palo, a relaxed neighbourhood of Malaga, near to the city’s beaches. El Palo also boasts many great little bars, corner shops and restaurants. You’ll also only be a short bus journey away from the city’s centre. Malaga University’s intensive courses start at 4 weeks, for only 397€ (£336 or $508), and the full semester term courses, three months in length, come in at a very reasonable 1645€. If you’re looking for a smaller school with a warm family atmosphere, yet a professional approach to teaching Spanish as a foreign language, Malaga Si is an ideal choice. This language academy offers highly personalised tuition to all of its students, and its teachers are carefully selected for their friendly, attentive approach. The school’s quality is backed up by its official accreditation from the Cervantes Institute, Spain’s national Spanish language organisation. The school is equipped with many mod-cons, including pleasant, bright classrooms, multimedia facilities, a computer lab and a library. The building also has its own gardens with a swimming pool. The school’s teachers and management believe that complete Spanish immersion includes venturing outside the school; therefore Malaga Si also offers a fun activity schedule that includes trips to local museums, going into Malaga’s centre to eat tapas, and even trips to the San Miguel brewery nearby. And with the beach only a 100 metres away, the school is also known for its summer beach volleyball matches and parties. Malaga Si prices start as low as 288€ (£241 or $400) for a two-week course including 20 Spanish lessons per week. But the school also has some great 2014 discounts for seasonal courses, like a 5-week spring course from 28 April to 30 May 2014 at only 472€, or 32 lessons over 2 weeks from 22 December 2014 to 2 January 2015, paying only 224€. 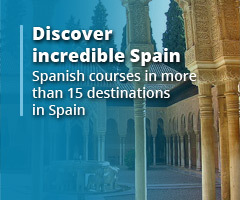 You’ll find more on Malaga Si and their full range of courses and prices here. Receive all the latest updates from our blog directly by email. 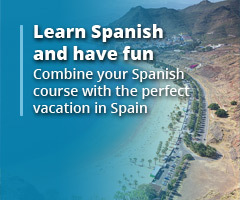 How Best to Learn Spanish as an Adult? How quickly can I realistically become fluent in Spanish?